Ontario, Canada. September 9th, 2013. “I live in the east end, I drive past this daily on a fairly busy street [Denwood Drive], I can’t believe it has taken so long to resolve this issue,” notes a loyal reader who identifies himself as “Mike” in an e-mail to SooToday.com news. 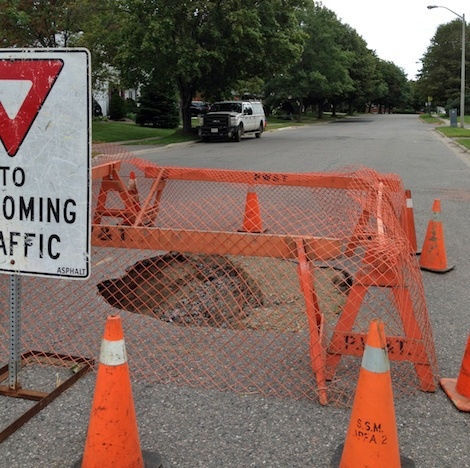 “This sinkhole developed sometime around July 26 during a major rainstorm we had in the Sault. It was filled in with gravel shortly after, and just pylons and the yield to oncoming traffic sign remained. A few weeks later, around August 25, there was another major rainstorm in the Sault, and the original hole became bigger, and barricades with snow fence were put up. 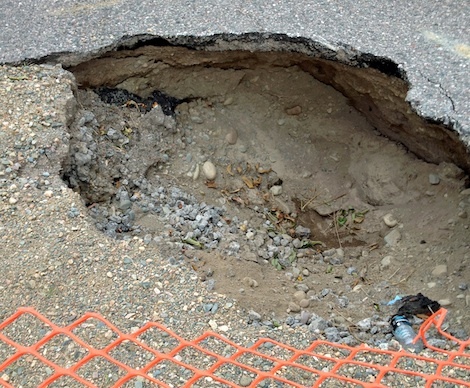 Since the rainstorm on August 25, this sinkhole has remained opened, and not been filled in or repaired and has looked like the photo I am including (taken on September 6). “Just down the road from this hole, City crews did some other work, tore up and repaired a bit of the road (as seen in the photo) on Friday, August 30 or so. I am not sure why they didn’t fix this hole then. “Also this sinkhole is just down the road from a public school too (see in photo), kids have been walking past this sink hole on their way to school for a week now. This entry was posted in Pictures and tagged Ontario, sinkhole. Bookmark the permalink.